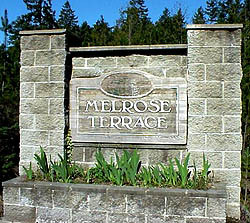 The Melrose Terrace Water Service Area was established in April 2005 when the RDN acquired the existing Melrose Terrace Strata Plan VIS3747 water system. The water service area is located near the Alberni Highway South West of Coombs. The water source for the Melrose Terrace Water Service Area comes from one groundwater well located nearby. The water supply is chlorinated, filtered, and stored in a single reservoir on site.